Click here for all audition materials (practice tracks and PDFs). Prepare a 30 second solo (unaccompanied) that shows off your voice. Do not sing anything classical (sing pop music, musical theater, songs from radio, etc.) 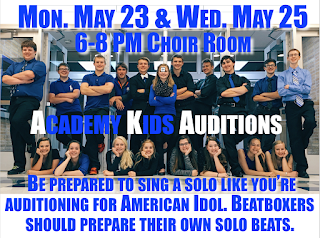 Prepare like you are auditioning for American Idol. If you are auditioning as a singer prepare at least TWO parts to the attached excerpts (“Believe” for the guys and "Elastic Heart” for the ladies). DO NOT prepare the solo part. If you are auditioning to beatbox ONLY, prepare the vocal percussion part. Please add any other drum patterns/get creative so Mr. Witte can see what you can do. Listen to the practice tracks in the Google Drive to get an idea of the vocal percussion patterns and sounds. If you are auditioning for both singing and beatboxing prepare at least ONE vocal part AND the vocal percussion part. Mr. Witte has created practice tracks with recordings of every voice part. To access these tracks and other resources, go to https://goo.gl/lJPAgT to access a Google Drive Folder with all the practice tracks. From there you can download the audio files to your own devices or save the folder to your own Google Drive account. Practice tracks and resources are there for you to use as much as you want. THE MORE YOU PRACTICE WITH THE TRACKS THE FASTER YOU WILL LEARN AND MORE CONFIDENT YOU WILL SING IN YOUR AUDITION. Monday, May 23, 2016 from 6-8 PM will be the rehearsal night for AK auditions. On this night procedures will be explained and music will be handed out and rehearsed. 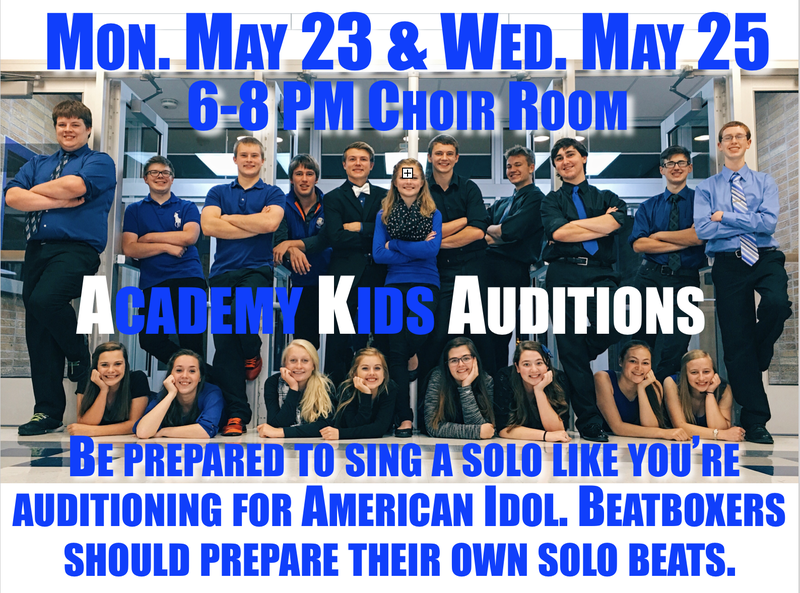 On Wednesday night, May 25, 2016 from 6-8 pm students will audition in groups of three or four. Students may be asked to sing more than once, so plan on being at WLA from 6-8 PM. You will be grouped with two or three other people for your audition – all of you will sing the excerpt in different combinations at least twice. You will be the only person on your voice part. Mr. Witte will make the audition schedule and groups. The sign up sheet will be on the choir room door. Being a member of AK is a special opportunity and should be taken seriously. Mr. Witte is looking for the following qualities. Do your best to showcase these qualities inside and outside of your audition. Your attitude and work ethic in choir class or other music classes makes an impression on your overall eligibility for these ensembles! This a cappella group will be singing contemporary music that could include pop, rock, jazz, hip-hop, R&B, dubstep, and many other genres. The group may include choreography and may require a purchase of specific outfit pieces. Notify Mr. Witte if you will be late or missing for a rehearsal because of athletic practices, games, or other conflicts. Work is not an acceptable excuse for missing practice. Be willing to try new things – take risks! If all members of AK take these expectations to heart, the group will definitely be SUCCESSFUL and FUN! Please see Mr. Witte if you have any further questions or concerns.